Choosing a Surgeon: What’s Best for You? Choosing a surgeon is very important considering that in many cases, he or she will literally have your life in their hands. Making sure that you have good communication, trust in the doctor’s ability, and accessibility/availability is key to finding the right surgeon for you. No matter how well qualified your doctor may be, you will not have a good experience if you cannot effectively communicate your concerns and get an adequate response. Most patients need a doctor willing and able to spend time discussing their concerns. Do you feel like your doctor answers all your questions? Does he/she provide information in a way that you understand? Do you feel comfortable asking all of the questions you have? o Do you feel comfortable performing this procedure? o What is the average complication rate? o What is your complication rate? o Can I get a second opinion? o Are you board certified? Is your doctor located in a place you can easily get to? Not only will it be more convenient for you, but it can also improve your rehabilitation. Your doctor will be close by to guide you and help if you encounter any problems. The spleen is relatively easily damaged and can rupture from a blow to the abdomen like in a car accident, sporting injury, or a fight, for example. Without emergency treatment, a ruptured spleen can cause life-threatening internal bleeding. Some ruptured spleens require emergency surgery. Your spleen can also become enlarged from many different causes such as viruses like mononucleosis, infections from bacteria or parasites, hypersplenism, or cancer, among other things. An enlarged spleen affects its vital functions. For instance, as your spleen grows larger, it begins to filter normal red blood cells as well as abnormal ones, reducing the number of healthy cells in your bloodstream. It also traps too many platelets. Eventually, excess red blood cells and platelets can clog your spleen, interfering with its normal functioning. 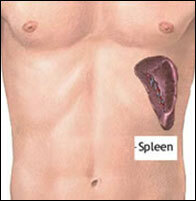 An enlarged spleen may even outgrow its own blood supply, which can damage or destroy sections of the organ. If you have any of the symptoms above or have been diagnosed with a spleen disorder, contact Dr. Johnson for a consultation. Because the pancreas isn’t seen or felt in our day-to-day lives, most people don’t know as much about it as they do about other parts of their bodies. It is one of those organs that we don’t think about unless there is something wrong with it. Unfortunately there are many serious, life-threatening ailments associated with this important organ. Perhaps the first to come to mind is diabetes – type 1 and type 2. We also hear about pancreatic cancer – all too often resulting in the death of someone. Learning about this organ and its maladies could prove to be a life-saving lesson. 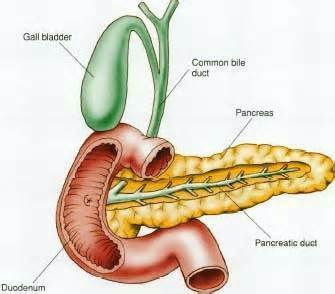 The pancreas is a long (about 6 inches) flattened gland located deep in the abdomen, with part of it sandwiched between the stomach and the spine. The other part is nestled in the curve of the duodenum (first part of the small intestine). It’s really two glands mixed together into one organ. The bulk of the pancreas is composed of “exocrine” cells that produce enzymes to help with the digestion of food. The second functional component of the pancreas is the “endocrine” pancreas. The endocrine pancreas is composed of endocrine cells that release their secretions such as insulin and glucagon into the blood stream helping to control blood sugar levels. Type 1 diabetes – the body’s immune system attacks and destroys the insulin-producing cells of the pancreas. Lifelong insulin injections are required to control blood sugar. Type 2 diabetes – the pancreas loses the ability to appropriately produce and release insulin. The body also becomes resistant to insulin, and blood sugar rises. Pancreatic cancer – the most common type arises from the cells that line the pancreatic duct. Because there are usually few or no early symptoms, pancreatic cancer is often advanced by the time it’s discovered. The cause of tumors is virtually unknown, but while there are different types of tumors, basically they are abnormal growths caused by uncontrolled cell division. Some theories suggest genetics play a part, others think trauma could be involved. Whatever the cause, the fact remains that the thought of having a tumor can be frightening. Sometimes a tumor can be quite serious and even life-threatening, especially if malignant or cancerous; however, many tumors are benign or non-cancerous. Usually a sample of the affected tissue or sometimes even the whole tumor has to be studied under a microscope (biopsied) to determine if it is benign or malignant. Benign tumors grow only in one place. They cannot spread or invade other parts of your body. Even so, they can be dangerous if they press on vital organs, such as your brain. Treatment often involves surgical removal because these tumors may be causing pain or affecting functionality of the organs involved. 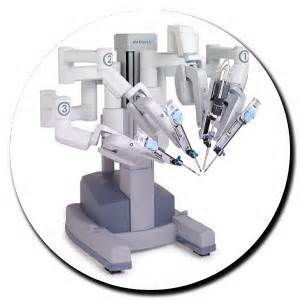 Robotic assisted surgery provides Dr. Johnson with a groundbreaking alternative to both traditional open surgery and conventional laparoscopy. It enables him to perform even the most complex and delicate procedures through very small incisions with unmatched precision. 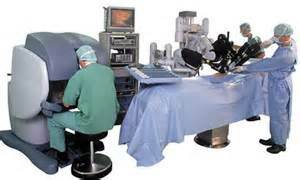 All surgeries have risks associated with them, but using minimally-invasive robotic surgery reduces many of the complications seen in open and even laparoscopic procedures. If you’ve been diagnosed with a tumor, whether benign or malignant, or you have symptoms often associated with tumors, contact Dr. Johnson for a consultation.